In a large pot boil water and add lasagna noodles, let cook until noodles are soft but firm. You want to be able to handle them, without tearing. Chop broccoli, onions, olives and garlic. Saute the onions and broccoli until the broccoli is soft and the onions are transparent. Add the garlic and let saute together for 2 minutes continually stirring so as to not over-cook the garlic. In a food processor combine your tofu, cream cheese, salt and a hand full of spinach. Mix until it turns into a smooth sauce. Pour a thin layer of marinara on the bottom of a 9 x 13 inch pan. In a seperate container mix the remaining marinara with your veggie mixture. Once your noodles are done cooking, add 3 of them going long ways on each noodle layer seen below. Follow the layer pattern below 3 times. 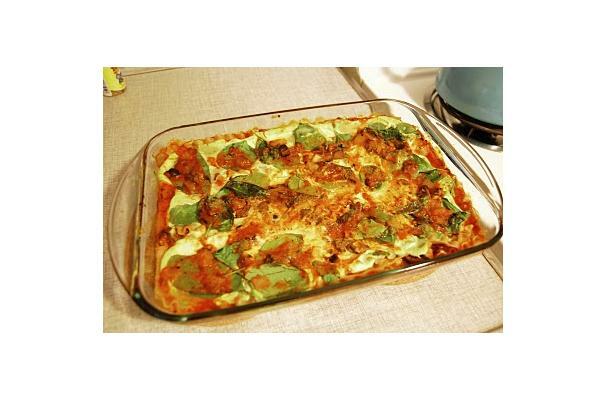 I will try this vegan lasagna..looks wonderful..Tanks.